The end of the year is coming up, which means there are car sales galore. which car is right for you? Here's a look at three popular three-row SUVs and a rundown of the advantages and pitfalls of each. Editor’s note: This is the first in a five-part series comparing a range of cars leading up to what many consider to be prime buying season. WASHINGTON — The end of the year is coming up, which means there are car sales galore. So which car is right for you? After years of low gas prices, big three-row SUVs are all the rage. 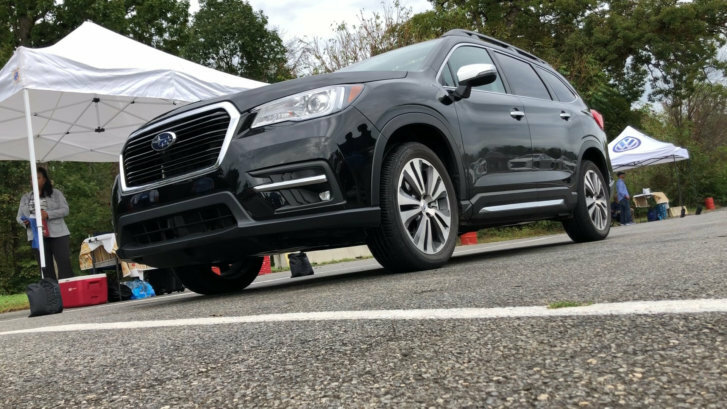 WTOP’s John Aaron and Mike Parris tested out the Subaru Ascent Touring, the Audi Q7 and the Lexus RX 350L and have the pros and cons of each car. So buckle up and get comfortable for these car comparisons. Pros: Lots of buyers want something bigger than the two-row Outback, and Subaru seems to have gotten the three-row SUV concept right after the dud that was the Tribeca. The interior looks at home in a luxury vehicle: The brown leather contrasts nicely with the company’s usual black-and-tan interior background. Looks- and comfort-wise, it compares favorably with much-more-expensive competitors. Cons: This big vehicle is pulled by a powerful — but small and strained — turbocharged four-cylinder. That, combined with the fuel-efficient Continuously Variable Transmission, can cause some lag before the power really lets loose.